I love this family so much! Getting to photograph them in my favorite place was so fun. It was actually the backyard of where my husband used to live so this place is extra special to me. Everett (the cute toddler) completely stole the show. I can't handle his cute little curls! I really love photographing families and this was such a fun evening with these beautiful people! Hey friends! I'm sharing something a little different today. While I absolutely love photographing people, my passion with photography started from traveling. So I thought it would be fun to share more of the pretty places I get to photograph. My husband and I took a trip to Iceland earlier this year and to this day we talk about how it's been our favorite trip ever. We always talk about how we can't wait to go back. It was number 1 on our bucket list for a long time. I did so much research before our trip because I wanted to make sure we didn't miss anything. But I honestly believe I could go back to Iceland 20 times and I would still discover something new. It's such a beautiful country and if you get the chance, GO! I would say Iceland is best known for waterfalls, hot springs and hot dogs! All of which are amazing. 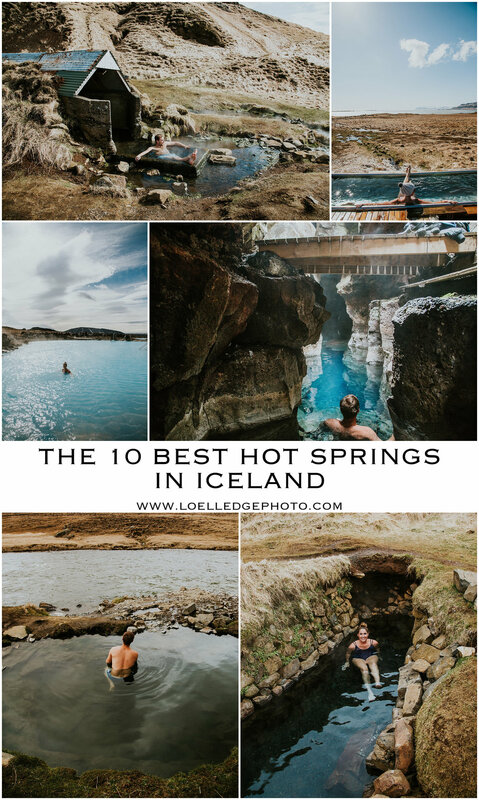 I searched high and low to find the best hot springs in Iceland. There are sooo many. They're called hot pots and with the cold weather, it was so nice to relax in one every day. I've rated my favorites below and included a few tips if you plan on visiting. I tried to get lots of pictures while we were there. But snapping pictures while you're in your swimsuit is not always an easy task. It's called Iceland for a reason. If you have any questions, ask me in the comments below and I'll get back to you! Also, let me know if you've been to any of these & which one was your favorite! Number 10 on our list goes to the Hoffell Hot Pots located in Hofn. There are 5 different pots and all have different temperatures. Some were cold and some were too hot to get into. There was really only one that had the perfect temperature so of course, everyone wanted to be in that one. It wasn't crowded when we were there and we shared it with a few other people. There is a changing room (where 2 other travelers are running to in the picture) and they ask for a donation. I think it was around $5 and it's based on an honesty system to leave your donation in the box. Tip: Wear a beanie when you're in the hot pots. I just threw my hair in a bun and later realized that parts of my hair were frozen haha. Grjotagja Cave is unbelievably beautiful. But unfortunately you aren't allowed to swim in it because its supposedly too hot. However, I will say that we stumbled upon a group of 6 European men skinny dipping here haha. I felt the water and it didn't feel too hot to me, but I read online that it's around 122 degrees. There is also Storagja Cave nearby, but I didn't get any pictures of it. I've never watched Game of Thrones but apparently a scene was filmed there. This hot spring took us a minute to find because we went on the opposite side of the river. It is right next to Reykjafoss waterfall, and I mean right next to it. If you look at the first photo, look to the right where the rapids are and that is the top of the waterfall. The location of this hot spring is so beautiful and was probably our favorite part of it. We felt like we were in the middle of nowhere and loved being so secluded. The temperature wasn't too hot so our stay was short, but getting to see the waterfall was an added bonus. I saw pictures of the waterfall online before our trip and it looked small and so it wasn't high on our list to see. But don't be fooled by the pictures, it's actually really big! Probably the number 1 tourist spot in Iceland is the Blue Lagoon. But I've listed it as number 7 on my list. Don't get me wrong, the Blue Lagoon is amazing! But I much prefer a spot that is off the beaten path and secluded. The Blue Lagoon is huge. You need to make reservations and do so early (weeks and months in advance) because they will book up. We made our appointment for first thing in the morning, which was nice to get there before tons of people showed up. Make sure you explore around the lagoon because some spots are a lot hotter than others. There is a poolside bar, a cafe and of course an area to grab yourself a mud mask. We planned on the Blue Lagoon as the last thing we did in Iceland. It's close to the airport and after a week of traveling around the island, it was way nice to relax at the spa before we got onto the airplane. I read tons of articles beforehand about what the water will do to your hair. I decided, I'm in Iceland, might as well go all in and get my hair wet. I'm so glad I did, but the water RUINED my hair. I followed all of the tricks I read online about smothering your hair with conditioner and leaving it in, going back in to reapply, etc. Nope, still ruined. My hair was gross for the next 2 weeks. So just prepare yourself for that. Also, how scary do we look with those mud masks? I laugh every time I look at those photos. If you want some entertainment, be sure to people watch everyone taking the dreaded run from inside the changing rooms to the water. Water Clarity: 7/10 - it's a milky blue so definitely not clear, but so beautiful! But with so many tourists around, there were two times where I found random pieces of trash in the water so I don't really want to know what the bottom of the lagoon would look like if the water was clear. Tip: Once you change out of your swimsuit, you're not allowed to go back to the lagoon and take pictures. Luckily, I had my go pro so I got pictures while we were in the water. But I wanted to head back to the lagoon after I changed to snap a few with my real camera and I wasn't allowed. The few I got below are from inside, by the restaurant. The location of this geothermal pool is so amazing. Unfortunately, the pool is so big that it's really not very warm. There is a pipe by the ladder and it pumps out really hot water. So I spent some time right there and was quite happy haha. But since the location is so beautiful I made it number 6 on my list. The hike is easy and gorgeous. How pretty are those snow capped mountains that blend in with the cloudy sky? There are changing rooms, but they are filled with trash. Really so sad that people do that, please don't be that person. I love the picture of my husband, Kenneth, carrying the Bonus grocery store bag of our clothes. We continued hiking and left the bag hidden so we didn't have to carry it. But then we completely forgot about it until we got to our car. Kenneth was so sweet though and ran all the way back to get the bag while I warmed up in the car. Tip: If you continue hiking past the pool, you won't regret it. You may even find a natural, steaming hot 'shower' that trickles off the mountain and even a secret waterfall. I read a lot of articles online that said if you had to choose between Myvatn or Blue Lagoon, choose Myvatn. I would say I agree! However, I think Blue Lagoon is so iconic that you have to experience it. Similar to the Blue Lagoon, we got there first thing when they opened and we were some of the first ones there which we loved. It's much cheaper than the Blue Lagoon and if you have a student ID, bring it! They give a good discount. Kenneth forgot his, but was able to pull up proof that he was a student on his phone (they have free wifi) and they gave him the discount which was nice. Similar to the Blue Lagoon, you'll find that some areas are hotter than others so swim around and explore. There's another huge pool that is a lot colder and it was nice because when you got hot, you could cool off there. There was also a smaller hot tub that was extra hot and fun to relax in too. Water Clarity: 9/10 - This is a beautiful milky blue, so not clear, but so gorgeous! I'm so sad because we didn't get to go to this one. We lucked out with great weather during our entire trip, but as we were getting near to this spot, a quick rain and then snowstorm was coming. We still had a ways to drive to get to our hotel and decided to skip it so we wouldn't have to drive in the dark. But based on pictures and what I've read, I think this would be high on my list. It's basically a hot river/stream in a valley. Pictures look so pretty! When we go back to Iceland, we will make sure we don't miss it! We found this hot pot on accident and I'm so glad we did! My favorite thing about Iceland is how you can find a million hidden gems. The location was amazing. I loved overlooking the ocean and the mountains. Apparently it was an old cheese tub? I'm not really sure what a huge tub filled with cheese was for but I'm glad it's now a hot tub! No changing rooms here but there was a rack to hang your jacket. This was located on the Northern side of the island. We visited Hrunalaug Hot Spring on our first day. It was our first hot spring experience in Iceland and we were over the moon. We had some time where we were the only one's here and it was amazing. There are lots of different pools to soak in too so make sure you try them all. As we were soaking, it started to snow and the sun was shining and it was one of those 'this world is amazing' type of moments. Make sure you're cautious when walking to the spring because I was a little too excited to get there and slipped in some mud and completely ate it haha. Also, notice the no pooping sign at the beginning of the trailhead haha. There is a small shack you can use to change into. It's not entirely private as you can see in the pictures but some people used it. Finally, the number 1 spot and you probably hate me because it's a secret! Luck was on our side to find this spot because we were off exploring when we found a rope on the ground. There was a small crack that the rope fell down into and we decided to climb down and explore. Imagine our surprise when this magical spot was at the bottom of it! The water was extra hot too. Pictures don't do it justice. It was a little piece of heaven. This spot sums up Iceland for me. So much beauty and so many hidden spots you can find. With everything being posted on social media these days, it was so refreshing to get out and explore this world without a phone. And there ya have it folks! The 10 Best Hot Springs in Iceland. Keep an eye out for more travel posts. If you missed it, take a look at the photo session I had in front of a beautiful waterfall in Iceland, HERE.